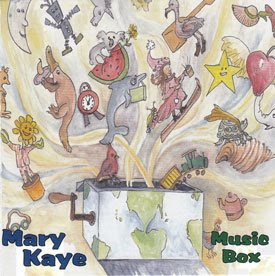 Listening to Mary Kaye's newest CD Music Box is an auditory experience. If a storybook filled with animals and all sorts of fantasy creatures could come alive in a musical way, the verses would most likely sound exactly like the songs on the album. Kaye sings with expression and animation and her words quickly spill out in a speak-sing fashion. 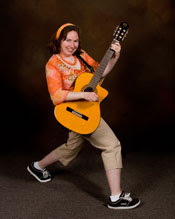 Her deep, low voice works perfectly for singing her folk-rock sounding songs that appeal to both kids and adults. She's been likened to a Natalie Merchant for kids by Parenting Magazine. The lyrics to her songs creatively and abstractly describe all sorts of interesting creatures and situations and she often uses short, catchy, fragmented phrases. My kids really like the silly song "Bug" where a poor bug is trapped under a cup inside the house. In my favorite song "Music Box," Kaye sings of all the sounds in the world like the tap tap tap of the woodpecker and squish squish squish of muddy boots. "Turtley Turleloo" sounds a bit like a yodel--Turtle-eeeee, Turtle-ooooo. If you try to sing along with any of her songs, I can guarantee your mouth is in for a fun work-out. Kids can settle down and relax with "Hot Chocolate Fairy" a cold-weather song and fall asleep dreaming of the quiet "Sleepy Land." Music Box is set to release on July 2, 2009. Mary Kaye is an award winning singer/songwriter based in southern Maine. With a background in both theatre and education, her music and concerts are both entertaining and thought provoking for children and their families. Her previous album, Spin Your Web won numerous awards. Win a copy! Mary Kaye has kindly offered to give away (1) Music Box CD to a Brimful Curiosities reader. To enter, take a look at Kaye's previous CD Spin Your Web and leave a comment with the name of your favorite song from the album. My favorite song is Blueberry Dreams! The kids and I really like Ten Robins! Pig Party made us smile. I see I made a typo - meant Pig Party! Sorry! follow on twitter(sendtocindy) and tweeted. My fave is "Child" because I have a beautiful child! I like the song "Pig Party"
We're ready for a pig party!! WE LOVE MUSIC...no tv for us....only satellite radio! I love Blueberry Dreams. Thanks! I'm an RSS subscriber to your posts. Thanks!